Tim Duncan is a marvel of consistency and production. 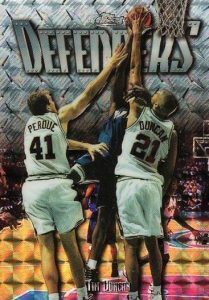 The ageless wonder ended his career after 19 seasons, but you would not think that watching him dominate the paint and consistently leading San Antonio deep in the playoffs, year after year. It took longer than it should have, but Tim Duncan is finally receiving some hobby love and his cards are trending upward. 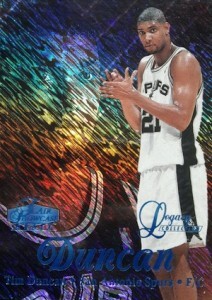 Shop for Tim Duncan Autographs Cards on eBay. 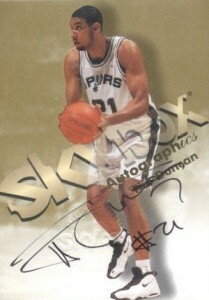 Unlike most modern star players, Tim Duncan does not have many certified autograph cards. 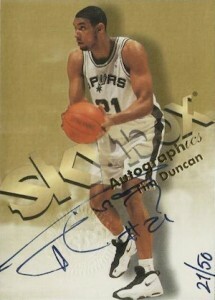 After signing a moderate amount early in his career, Tim Duncan has few autograph cards to speak of since 2005-06. This places an immediate premium on any of his certified autographs, which are not in great supply. While his playing style might be viewed by some as lacking flash, even without a ton of autographs, his cardboard career is anything but boring. 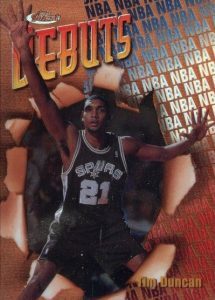 The following lists looks at ten of the top Tim Duncan cards in history. 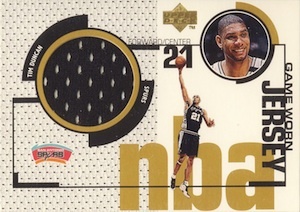 The checklist is definitely more on the premium side as these are some of the most popular Tim Duncan cards in existence. 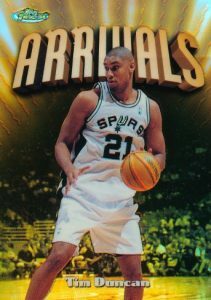 View our Tim Duncan visual rookie card guide for a complete look at all the Tim Duncan rookie cards, many of which are quite affordable. Click on the images or card listings below to shop on eBay. Linked text in the descriptions go directly to detailed set profiles or card guides. 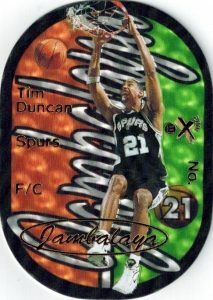 Since the rare Jambalaya insert also includes Michael Jordan and Kobe Bryant, it is easy to forget that Tim Duncan is available. Even though he was only a rookie at the time, many felt confident that the overall number one pick would be special. They don't get more special than this, with odds of 1:720 packs. The limited 1997-98 E-X2001 insert has enjoyed considerable staying power and value in the hobby thanks to a unique die-cut design, bright colors and considerable rarity. 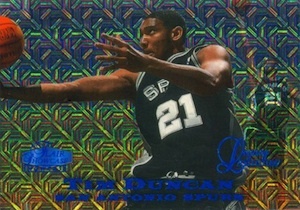 Finest normally has a lot going on and it does not disappoint with three different first-year cards for Tim Duncan in 1997-98. The real prize, however, is the Refractor parallels for the Bronze, Silver and Gold (#/289) cards. The most valuable option is a die-cut Gold Embossed Refractor, numbered to 74. Similar to Finest, Flair Showcase also utilized multiple card versions with increasing rarity. The various tiers run from Row 3 to Row 0 and also include Legacy Collection parallels. These limited parallels are numbered to 100 and command a significant premium. 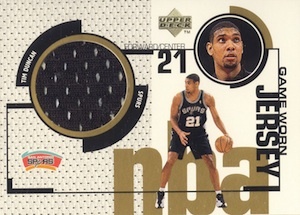 Arguably one of the most prized basketball parallels in the history of collecting, Precious Metal Gems also made their debut in Duncan's first season. All the 1997-98 Metal Universe PMG cards are numbered out of 100, with the green occupying the first ten cards and the red filling the remaining 90 cards. 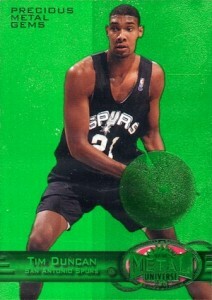 1997-98 Topps Chrome is easily the most preferred Tim Duncan rookie card and prices are still very reasonable. The Refractor parallel is where things begin to get crazy, especially high grades. 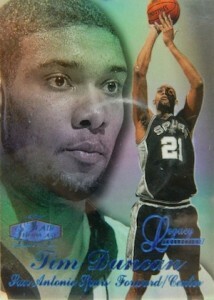 One of the earliest NBA cards autographed by Tim Duncan, Autographics already has a legion of fans. The base version is not the easiest to track down, but the rare blue ink version is hand-numbered to only 50. 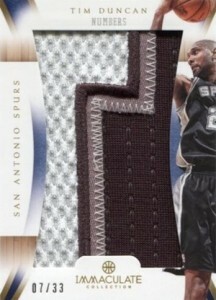 As the first NBA jersey card for Tim Duncan, the Upper Deck Game Jersey insert carries special significance. There are two similar versions for Duncan and the only difference is the small player images that are featured on each card. 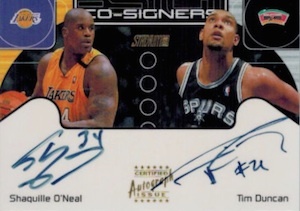 Widely considered two of the best big men from the modern era, Shaquille O'Neal and Tim Duncan are paired on this signed card. 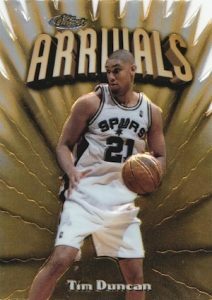 The combination is also interesting because Shaq reportedly bestowed the "Big Fundamental" nickname on Duncan. Since signed cards for Tim Duncan remain rare, it is really hard to point to specific autographs as being better than others. 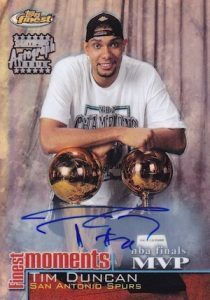 The Finest Moments Refractor Autograph insert from 2000-01 is particularly remarkable because it includes an on-card autograph and photo of Duncan posing with his first NBA championship trophy and Finals MVP Award. He would go on to add three more titles and two more Finals MVP awards. 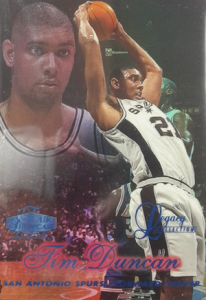 Without a large supply of autographs, collectors must look to Tim Duncan memorabilia card options for more premium options. The best choices are found in high-end releases that have come to dominate the modern basketball card market, including Flawless and Immaculate Collection. 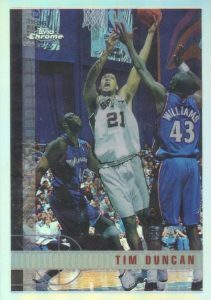 I have a Tim Duncan HM-TD FLEER 04-05 #35 of 50 hoops hot materials NBA HOT PROSPECTS RED LABEL! What might it be worth? I was lucky enough to pull his autograph from 2004-05 Luxury Box, the same set (but different box) that I was able to pull a 1/1 out of. (different player) I love that set. He has always been a favorite player of mine since he entered the league, and I am sad to see him retire. I’ll be posting a tribute to him- with a scan of the autograph and some of my favorite cards of his- within the next day or two.